This is simply a great house! A wonderful vibe, sunny and bright & only 4 blocks away from the sands of the world famous Huntington Beach.This is an wonderful 3 bedroom 2 1/2 bath nearly 2000 ft.Â² home on the sunny side of the street.100's of thousands of dollars in upgrades over the last 2 to 3 years including fabulously redesigned kitchen and bathrooms.All the finest material is used with granite,tile and custom cabinets throughout.Great floor plan with two fireplaces,one in the living room and one in the family room off the kitchen perfect for entertaining. Enjoy outdoor living at its finest with French doors leading to a large sunny front patio and great back yard with an all new stamped concrete patio. Many other new upgrades include windows,lighting,solar dual zone air-conditioning, new furnace. Etc. too many upgrades to count.You won't be disappointed.Desirable location on the sunny side of the street plus itsâs on the preferred higher numbered streets known for it's quiet nature and uniform neighborhood.Highly rated Huntington Beach High School,Dwyer Middle School & Smith Elementary School only a couple blocks away.All this located within walking distance to unlimited entertainment choices including downtown Main Street,world famous HB Pier, restaurants,Pacific City & hotel district. 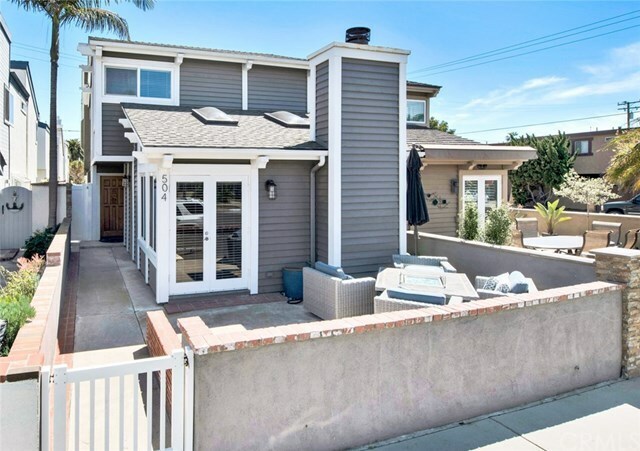 Only a couple miles to Newport Beach to the south & Huntington Harbor to the north with great water activities.Huntington Beach is the best priced beach property in Southern California! Directions: Go north ofn PCH from Beacvh Blvd. and turn right on 20th Street and up 5 blocks.